Dani Barajas and the no. 5 seeded Battle Mountain Huskies open the 4A Western Slope postseason Wednesday, Oct. 24, at home against no. 28 Kennedy. Barajas is one goal shy of setting the school scoring record. Add playoff preps soccer to the large list of sporting events happening this time of year. On Wednesday, Oct. 24, No. 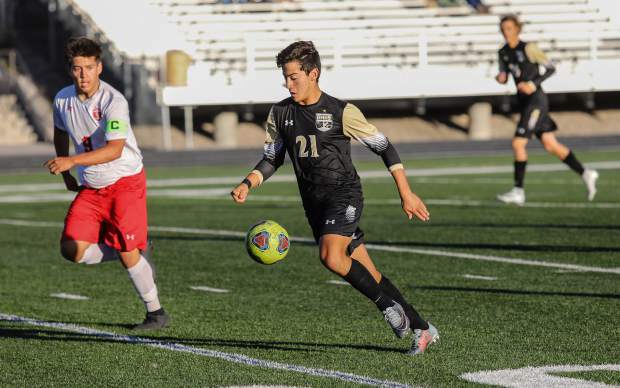 5 seeded Battle Mountain soccer kicks off another playoff appearance in the 4A Western Slope at home against No. 28 Kennedy at 4 p.m. In the 3A Western Slope, No. 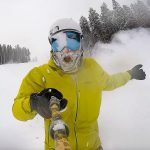 8 Vail Mountain School opens at home against No. 25 Jefferson Academy at 4 p.m. on Thursday, Oct. 25. For both teams, a home playoff game early means they are favorites to win, adding a little pressure. But staying in their own beds and not dealing with travel serve as advantages. For the Huskies, the Commanders out of Broomfield come to town with a high scoring offense, led by Brian Martinez-Leyva, Aymaro Vargas and Arye-el Ramos Martinez. Dani Barajas is tied for the Battle Mountain school scoring record at 24 goals, averaging more than one goal per game. Jared Vargas has scored 10 goals in the last four games. On the other side of the ball, goalie Jackson Borg is giving up less than one goal per game. “We’re going to start 11 players tomorrow who all have at least a goal or an assist, including the goalie,” Cope said. The Huskies went to the state finals in 2016 and last won in 2012. No, the orange jerseys aren’t to celebrate Halloween. You know it’s playoff soccer when Vail Mountain School busts out the orange. In 1998, the Gore Rangers made the playoffs having won one game that year (ironically against Battle Mountain). Then coach Bob Bandoni showed highlights of the Netherlands winning the 1988 Euro Championships. The Dutch, like the Gore Rangers, were one of the smallest teams in the tournament. Bandoni handed out orange jerseys for that postseason, and VMS beat Bishop Machebeuf, 7-0, and the tradition was born. This year, the Gore Rangers open against Jefferson County, a team that has scored fewer goals and given up more goals than VMS. The Gore Rangers are riding a three-game winning streak, beating teams 16-3 in that span, including two shutouts.